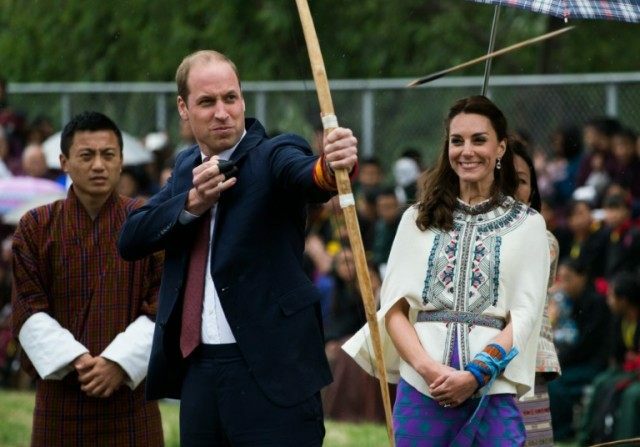 Thimphu (Bhutan) (AFP) – Britain’s Prince William and his wife Kate tried their hand at Bhutan’s national sport of archery on Thursday as they began their first visit to the tiny Himalayan kingdom in a whirl of colourful dancing and music. The couple laughed as they tested their shooting skills at an open-air archery venue in the Bhutanese capital Thimphu to loud cheers from the gathered crowds — even when they missed the target. Bhutanese archers must aim at very small, brightly decorated wooden targets positioned 145 metres (475 feet) away from where they are standing. The Duke and Duchess of Cambridge were allowed to move a little closer than that, but were not able to hit the target despite coaching from the experts. The couple had braved the rain to head to an archery competition in the open-air stadium, where they chatted to local people after earlier meeting Bhutan’s king and queen. They flew into the picturesque mountain kingdom on Thursday morning from India, where they played cricket, hung out with top Bollywood actors and laid a wreath at a memorial to India’s war dead. They will spend two days in the tiny kingdom, famously the last country to get television and home to just 750,000 people. A row of monks bowed to the couple as they arrived at the Tashichho Dzong fortress in Thimphu for their private audience with King Jigme Khesar Namgyel Wangchuck and Queen Jetsun Pema. Bhutan’s Oxford-educated monarch — known as the Dragon King — greeted the British couple in Bhutanese national dress, which is still required to be worn in schools and the workplace. His wife also wore traditional dress, while Catherine, Duchess of Cambridge, wore a black and cream cape top and a long blue printed skirt made from fabric hand-woven in Bhutan. King Jigme came to the throne in 2006 after his father abdicated and agreed to cede absolute power to a parliamentary democracy. The country held its first elections in 2008 and is known for pursuing a unique economic development model of “Gross National Happiness”, which aims to balance spiritual and material wealth. Later the couple will have a private dinner with Bhutan’s king and queen. On Friday they will take a six-hour trek to Paro Taktsang, a spectacular Buddhist monastery perched on a cliff edge.